(Your business) breaks sales records!!! Music to your ears? It certainly is for Star Wars creators who witnessed fabulous first week success. Their latest offering ‘Star Wars: The Force Awakens’ has created box office records by quickly garnering more than 1 billion globally. Would you like your business to follow Star Wars way to glory? You can, by using targeted marketing that positively nudges customer decisions towards purchase and repeat orders. Take one of our customers, the largest private lenders in Asia, for example. The bank, with its treasure trove of in-depth customer profiles, provided customized and more importantly, relevant loans along with cards etc. Another FMCG biggie made use of customer demographic intelligence to run campaigns for their economic product satchels in rural areas through radio, local newspapers etc. Traditionally, marketers relied on marketing funnel philosophy to develop and implement their campaigns. The funnel envisioned a push strategy wherein the customers were bombarded with product information (whether relevant or not and with limited touch points) in an effort to capture mind space. They then prayed that the customers would remain loyal. This approach is a big mistake today where the world is hyperactive on ‘digital’. Technology in the modern world gives multiple touch points like the web, social, SMS, mobile, wearable etc. It’s a sin to fail to capture information and engage customers in emerging channels. The star wars franchise took into account different media types, web penetration levels in desired geography, accessory choices, audience demographics etc. to become a blockbuster. Here’s how you can take a leaf out of their marketing book. Different elements like marketing strategy, budgets, channels, messaging etc. should be aligned perfectly to deliver a strong campaign. It will help your business to deliver the right message at the right time to the right place. And this matters in today’s intensive competitive environment. Alignment avoids resource wastage. It aids you in prioritizing objectives like whether to invest in active or passive loyalists, additional web properties etc. Lack of alignment may also lead to customers to perceive you of being out of date with the times. We have been taught since childhood to make a great first impression for better relations. It’s the same for businesses. You made an expensive purchase at Amazon.com with a credit card. Though the amount was deducted from your card, the order page shows a ‘Payment failed. Please revise payment options’ alert. Panicking, you search for help on the website. Amazon offers to have an agent to call you instead of the other way around. Within minutes, you receive a call. The agent, without your input, correctly identifies the reason you made the call. Relieved & ‘surprised ‘that at the level of accuracy, you confirm the issue. The agent clarifies the system error and assures you that the payment has been made and the product has been dispatched. He even advises you on how to remove the offending alerts. Suitably impressed, you decide to make Amazon the sole destination for online purchases. When you create a great first impression on your customer, you positively influence him when he weighs his options, take a purchase decision and even go for repeat sales. Remember this on your first after sale contact as well. Interrupting your customers buying thought process gives you the best chance to sway their purchase decision in your favor. By using customer intelligence gathered by browsing behaviour, buying traits, interaction histories etc, time your marketing campaign deployment through channels like SMS, mailers etc. Be sure to disrupt in the evaluation phase to make the maximum impact. Before the advent of social media, marketing campaign used to be company driven (push strategy). Companies owned the marketing process and could chose what, when and where to bombard the customers with information. Advent of technology and social media prevalence has now put customers in the driver’s seat. They have instant access to a plethora of information to help them decide (pull strategy) for themselves what’s great, average, bad and fake. Improve marketing impact with the help of online reviews, word of mouth or referral schemes etc. The most opportune time to put resources in dealing with competition is ‘after sales’. Why? 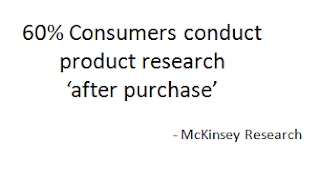 It is true that customers conduct active research about products that they intend to purchase. However, it is equally true that the interest and relationship deepens after they have bought the product. They need to re-enforce their belief that it was money well spent. Make their belief stronger with great after sales service, enough to make them brag about their purchase to their network. Focus on customer pain areas and watch them come flocking to you. For example, one of our automobile manufacturing customers now offers online visitors ‘digital car configurators’. Visitors can build their car online and take a test drive. They are often amazed at the simplicity and unique experience which the configurator provides. Another customer, a large banking major, started offering lower EMIs over longer duration for personal and home loans, thus increasing rural penetration at never before seen levels. Analyzing customer behaviour with the help of Cloud CRM will give you insights on customer pain points. Last heard, Star Wars the Force Awakens was racing ahead to overtake ‘Avatar’ as the largest movie block buster of all times. Put the above six points in action and watch your business follow suit. What other marketing lessons would you like to share with us?